I love marketing. I also love reading. So when I realized that out of all the books I’ve previously been reading about business (Never Eat Alone, The 4-Hour Workweek, etc.) not a single one was specifically about marketing, I was shocked. And while those books definitely provided great advice and inspiration, I thought it was time to read one specifically for marketing. 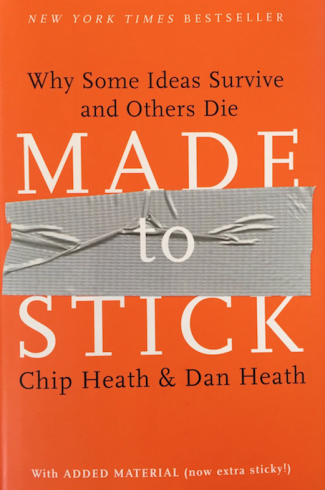 Enter Chip and Dan Heath’s “Made to Stick.” This book is all about ideas – more specifically why some ideas thrive, and why others fade away. I read the ‘extra sticky’ edition, and wanted to discover if the Heath brothers’ ideas were as sticky as the ones they studied. “Made to Stick” was easy to read. The Heath brothers did a fantastic job of making it sound as though they were having a conversation with you. The tone of the book made it possible to finish in only a few hours, and not feel as though you needed to be locked away in a quiet room to truly concentrate and read every word analytically for fear of losing understanding. The Heath brothers did a great job at making their message easily digestible, teaching you about marketing while also being entertaining. My favorite part of “Made to Stick” was the interesting examples. The Heath brothers provided a variety of compelling stories, examples, and biographies, while at the same time not overwhelming their readers. While some books I’ve read have what seems like a new example in each and every paragraph, and others focus on the same four examples over and over again, “Made to Stick” featured many varied examples, but keep them reoccurring throughout later chapters. This way there is not only diversity, but it also helps tie the chapters together, showing that certain ideas are sticky not just because of one reason, but because they tie together multiple attributes of successful ideas. The examples themselves were interesting as well, starting from the very first page where the Kidney Heist urban legend is shared, and holding true throughout the book while a nice mix of historic, famous, lesser known, and even plain untrue sticky ideas. The way “Made to Stick” was formatted also helped make it a good read, as it was organized so well. Each chapter was dedicated to one of the letters in the acronym SUCCESs – simple, unexpected, concrete, credible, emotional, and stories. But within each of these chapters there were shorter passages and breaks that made it easy to understand. By having many short passages, each filled with different examples and focus points, the Heath brothers made their book an easy read that gets the main point across without overwhelming the reader with mountains of text. Another aspect of “Made to Stick” I enjoyed was how certain examples tied into marketing techniques I had either been taught on the job or in classes. Although the book in its entirety is about marketing and advertising, there were instances where specific marketing practices were referenced. For example, in the ‘concrete’ section, the Heath brothers wrote about how employees can get a clear view of the customers they are trying to reach. To do this they referenced one company that described ‘Saddleback Sam,’ a typical customer, over the course of a few paragraphs, describing his demographics and how he enjoys spending his time. This is an example of a buyer’s persona, a fictional representation of a customer, something I learned about in my introductory marketing class. Reading “Made to Stick” and coming across more marketing examples than I expected was not only exciting, but shows that the Heath brothers truly understand marketing and the concepts they promote. While I enjoyed reading “Made to Stick,” at times I felt as though it was more conceptual rather than providing actionable steps for the reader to create their own sticky ideas. While each chapter focused on a different method for creating a sticky idea (simple, unexpected, concrete, credible, emotional, and stories) there wasn’t much focus on how the reader could create his or her own successful sticky ideas. I did, however, enjoy the case studies within each chapter that highlighted different situations and showed two different messages for the reader to decide which was stickier, but even that was not a guide to developing a sticky idea, rather identifying sticky ideas. While “Made to Stick” did a good job showcasing how an idea could be crafted a certain way to increase its impact, it didn’t do nearly as good of a job showing how to combine the strategies together to create the stickiest idea possible. The lack of integration between chapters made it seem as though “Made to Stick” could have been a short essay or a blog post instead of book almost 300 pages long. If most of the examples had been removed, the book could be quickly boiled down into a blog post referencing the six best ways to make an idea stick. While I personally enjoyed reading the book and think the examples are what will make the ideas stick with me, someone else unwilling to make the time investment might not consider the examples worth the extra length. While I definitely enjoyed reading “Made to Stick,” I felt as though overall it was better for entertainment and learning some more basic marketing concepts, rather than understanding more complex marketing techniques. If you want a book to ease you into more information heavy books, or if you just want a business book that is a breath of fresh air, this book is for you. This entry was posted in Book Review, Business and tagged book-review, business-book-club, chip-and-dan-heath, made-to-stick, marketing. Bookmark the permalink.